If you aren't saying 'awwwwww' right now, your awww-er is broken, and you should seek medical attention. Seriously, isn't this cute as a whole button-factory's worth of buttons? Missy (who sells on eBay as Spring*Bean) made this … that's her youngest (I think) modeling. 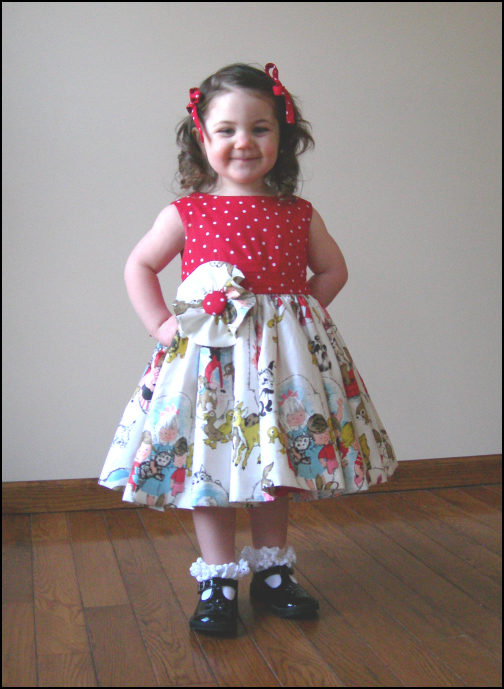 You know who else makes incredibly adorable girls' dresses? With the smocking, and the bows, and everything? Retro Grace. I've become addicted to her blog … but who can blame me when she features things like this? I think it's probably lucky that I have a little boy, because if I had a little girl I would be doing nothing but making her dresses like these, and (knowing the way the universe likes to have its little joke) she would probably hate them, and want to dress like a Bratz doll. And besides, it's a lot faster to make the kind of thing my son likes (namely, silly CafePress t-shirts). That little cutie is sooo happy with herself, and I bet she thinks her mum is just the best mum in the whole world for making that dress! I love that green dress! I don’t think I ever outgrew the aesthetic I had when I was five. I’d definately dress my niece in the green dress! But the red & white one is overkill with the hair bows, ruffled socks and black patent shoes. And they yellow flowered dress is too busy: busy print + busy embellishments = too Busy! AWWWWW yep my awwwwer is working just fine today…sweeeet pic! Yep, just checked; my aww’er is working just fine. One of the lovely things about little girls is that they still LOVE that sort of stuff. Later, they unfortunately want to look like 16 year olds, or Britney Spears, whichever comes first. 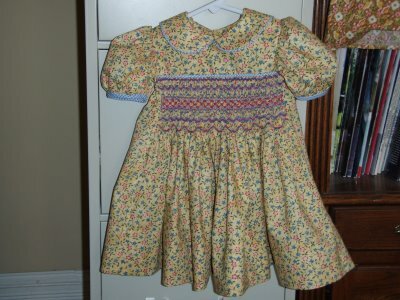 For little girls, the more bows, ruffles, etc. the better they like it – and bless ’em, it is a good thing that there are still people around who will make them dresses that will fulfill their ruffle-filled, vain little hearts. Because later on, you can watch them yank up low-rise jeans at the age of 11 in the effort to cease looking like a little girl at all. And THAT is a really sad thing.I love all of those dresses and look forward to having granddaughters that I can lavish the same sort of stuff on. Ruffles – bring ’em on!! I wish that Henry! shirt came in adult sizes. My friend has a little knit monster named Henry and he’s always getting into trouble and adventures. It would be perfect for her. Definitely awww….My mother was so frustrated by my niece when J was this age. Mom kept buying adorable little dresses and J was an overalls kind of little girl. I wish I had known about the Henry! shirt a few years ago, say, when my Henry was about 4, rather than the highy self-conscious 13 he is now. Though I could see giving these out at a birthday, bar mitzvah, or graduation party…. How embarrassing would that be!All hail Henry! There is no such thing as overkill or “too busy” for little girls. It is also the case, of course, that they’ll carry that principle out in unexpected ways, like the little girl who wears her Spiderman costume to my church every Sunday as a compromise with her mom, who doesn’t want her to wear it every single day of the week. She was quite the festive sight on Easter. She is too cute. I lovethe dress and how happy she looks modeling it! 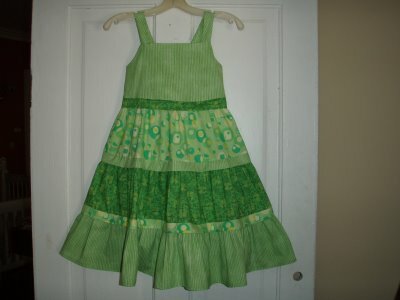 I love children’s clothing… particularly pretty dresses.Is it weird to start clothing shopping for kids before you have any? I couldn’t stand dresses or all that girly crap when I was little…now I often walk by the children’s section of stores with envy, because they have more interesting, colorful, happy clothing. Shoes, too. I’m frustrated because I just took the time to write out a comment for this blog, and then blogger insisted that I must cooperate with it switching all my info to google, and then, after doing everything exactly the way blogger wanted, it apparently lost my comment AND wiped all the “who I am” information from my blogger profile! And tried to use my google display name instead of my blogger one … not Erin’s fault, nor anyone else’s, either, but there seemed to be no way to complain to blogger/google directly about such a wasting of peoples’ time, and even if there IS a way to complain, it should have been OBVIOUS! And now I don’t have time to investigate my (blogger? or google?) accounts to make them right again, which means I’ll likely have to take the time to deal with what seems to have gone missing from my account(s) next time I try to post here. Ugh. I swear the new technology, along with the positives it gives us, has created infinite new ways to waste our precious time! This aspect of it feels so *disrespectful*, as though old needs that used to be taken into account just aren’t anymore — as if the history of some of our needs (basic human communication fundamentals) has been erased, and so often there doesn’t even seem to be a place to put our voice to complain about it.I’d tried to post, but in a much better thought-out way than I have time to reproduce here, that:a) I also greatly prefer the colours and styles that children’s clothing stores feature and wish they were available in women’s clothing.b) I also didn’t like ruffles and such when I was a girl in the late 50’s and early 60’s and found it much more comfortable to play in pedalpushers when pushing/plowing Dinky cars around in moist sandboxes, hiking with bunches of kids in the ravine, or floating plastic boats along the canals we rushed out to dig in our gravel driveways right after a decent rain. Also. wearing slacks to play in was much more modest since we girls weren’t ever supposed to show our leotard-covered bums so it was hard to play in a dress.c) Now I read DressADay every day and LOVE, LOVE, LOVE the Studio Tantrum’s girls’ patterns that people make up and post on PatternReview and wish they came in adult sizes. Oh, to have and wear the unbeatable and fantastic Rodondo Skirtwith the Hermosa Wave Flounce shirt! I had to come back and look at today’s and yesterday’s post because I am having a crappy week. This blog is better than Prozac! Okay, if people want I’ll put up a grownup-size Henry! shirt. I’ll make it a bit different from the kid-size one … just let me know. Missy — Okay! You *are* lucky! So, are you saying that the Redondo’s already come in women’s sizing, or that they’re still only in girls’ and need to be sized up from there?Also, where is a really good place that can one view and purchase Studio Tantrum patterns? I follow links from people who’ve reviewed them in PR, but often find the progression confusing.I’m in Canada and only read and speak English, if it matters. My daughter would wear nothing but dresses from age 1 to 4. These are just splendid. Those Bratz dolls aren’t even human! awwwww, is right. that girl is such a cutie! and i just love all the dresses. makes me wish i was a little girl again. And of course I immediately pointed my friend who has a son named Henry toward your t-shirt. I would take a shirt with a giant “Elizabeth!” across it any day of the week. That sweet little girl has attitude! Lovely dress, too. Shoes, too.Not to mention hats. Who hasn’t gone shopping for a little girl and come away yearning for a pink and purple fleece hat?